What’s better than good wine, good food, and good company? having all of that WHILE being at a sporting event!! And not just any sporting event!! A San Antonio Spurs Basketball Game!!! LOVE ME SOME SPURS!!! They are definitely my favorite team in the NBA, but then again I am biased because I am a 22 year resident of San Antonio. I’ve been rooting for the Spurs since I was in Pre-Kinder! (long before they were the monstrosity of a team they are today!) And just put me in front of a sports game and I get all into it, screaming, yelling, squeeling, cheering, covering my eyes, biting my nails, the whole bit. but c’mon, give me a break … I just get a little caught up in all the excitement. And don’t put me in front of a football game, this little Texas wine drinker loves her some good ole American Football! Anyways, back to my Spurs!! I was outrageously lucky enough to be invited by my dear friend, Melissa Unsell who is outrageously lucky enough to be privy to 2 box seats on the restaurant level of the AT&T Sports Center. Let me tell you, drinking beer and eating nachos has its place, but this was first class all the way!! I think I may have found my new favorite way to watch a game at a sports center. Give me some good food, good wine, good company and some SAN ANTONIO SPURS and I am one happy woman!! 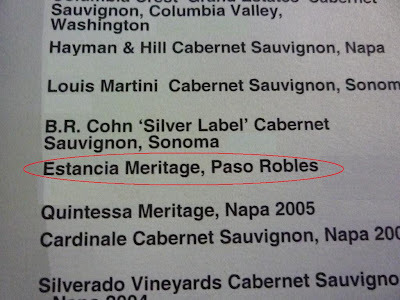 I also love the Spurs because their head coach, Gregg Popovich, is a HUGE WINE lover. Gregg, if you some how read this, maybe you are a big fan of my blog, who knows…..We should, NO WE NEED to drink wine together sometime when I am back in San Antonio working on my Master in Wine Biz Thesis. 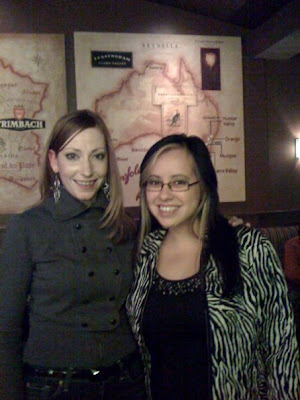 Maybe you would be up for me interviewing for my thesis? If anyone who is reading this knows Gregg, would you do me a big favor and send him the link to this entry =) Ok, back to the game…. TONY PARKER!!! OMG, and in case you didn’t know, Frenchie, my frenchman …. he bears an insane resemblance to Tony Parker, or as Frenchie says, Tony Parker looks like him. MAKE SOME NOISE!! GO SPURS GO!! Shot some video of the game, the Spurs were playing their longtime rivals, the Dallas Mavericks, who won by the way and that really put a big pimple on the rest of my evening, but whatever, we all know that the Dallas Mavs smell =) One year my dad’s side of the family, from Dallas drove the 5 hours to San Antonio, just to sneak into our house and put Dallas Maverick decorations everywhere! My dad was soooo pissed, hahaha! But don’t worry, my dad taught me never to get mad. And time for the essentials…..WINE!! 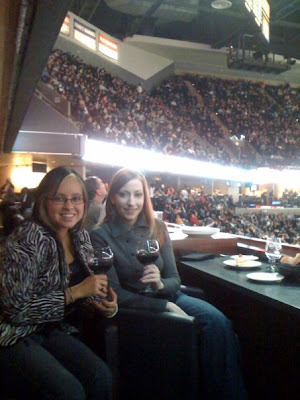 Melissa and I decided to have a white wine for the first half and a red wine for the second half. The wine list wasn’t half bad, but I like all sporting event pricing, the mark ups are ‘slightly’ higher than normal. 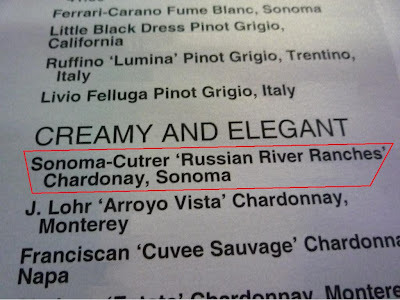 As you can see we went with the Sonoma-Cutrer “Russian River Ranches” Chardonnay from Sonoma, I remember it having a mix of citrus and tropical fruit flavors, a slight spice, round. And it went well with the food. Some shots of the buffet! Mmmmm! Time to get my GRUB on!! I wanted to tie myself a bib with the cloth napkin, but Melissa vetoed that idea real quick! She said it would be a distraction to the Spurs while they were shooting free-throws. What can I say, I’m a messy eater =) Hence the nickname Messy Ceci….. The wine was yummo, big red fruits, kinda jam-ish, some spice, very nice tannins, they weren’t too overbearing and some cocoa type flavors too! Man how I missed these Bordeaux/Bordeaux Blends. Studying in Burgundy has WICKED advantages wine-wise, but it is rather impossible to find a Bordeaux and vice versa due to the Burgundy/Bordeaux Rivalry…..eh eh, get it……Spurs/Dallas rivalry……Burgundy/Bordeaux…..coincidence….I think not! So I am lucky enough to have one of the coolest priests on the face of this planet as my amigo/ami/friend. No, really…..take everything a ‘typical’ priest is like…..and THROW IT OUT THE WINDOW! If I could compare this to a song….it would be like what FunTwo’s Canon Rock is to the classical version of Pachelbel’s Canon in D! Anywho, he is also a BIG Spurs fan! A lot BIGGER than I am, ’cause he was 10 rows from the court….mild jealousy issues occurring. But being the silly gal that I am, I had to find him from my seat. Can you see him? Here let me help you out….He is…..
That was a lot of fun, we were being big dorks and waving at each other the entire time! hahaha. On a side note, how much do you love the “Women’s Restroom” sign? Previous Previous post: Random Late Night Internet Search…. Next Next post: It’s like getting pied in the face, only this is a wine blog and not a pie!